DeMarcus Cousins #15 of the Sacramento Kings looks at a referee after being called for a foul against the Chicago Bulls at the United Center on January 21, 2017 in Chicago, Illinois. 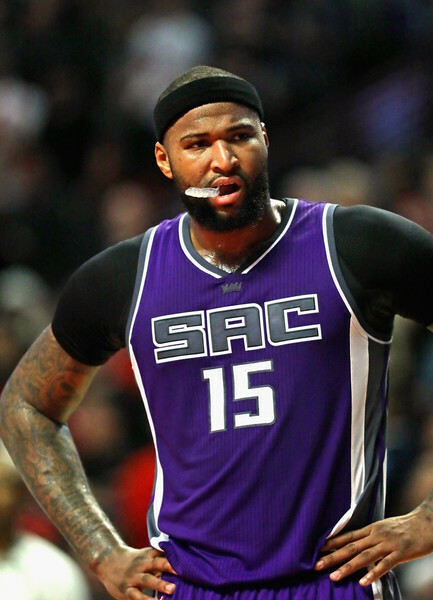 *Center DeMarcus Cousins of the Sacramento Kings will neither be arrested nor prosecuted ‎for the Dec. 5 altercation at a Manhattan club that resulted in teammate Matt Barnes facing misdemeanor assault charges. Citing league sources, ESPN.com reported that Cousins has been “cleared of all wrongdoing” by authorities. The Sacramento Bee reported last week that Barnes is expected to turn himself in to the New York Police Department to face his misdemeanor charges, but the newspaper said it was unclear whether that would happen during Sacramento’s current eight-game road trip. The Kings are playing in Philadelphia tonight (Jan 30). The alleged assault took place at the Avenue nightclub after the Kings lost to the New York Knicks at Madison Square Garden on Dec. 4. Barnes was accused of choking a woman but has maintained his innocence. Barnes and Cousins, who were together that night, have been named in a civil suit stemming from the incident filed in a New York District Court by plaintiffs Jasmine Besiso and Myrone Powell. The lawsuit alleges that Barnes grabbed Besiso by her neck and began choking her at approximately 3 a.m. after a commotion at Avenue. Cousins is alleged to have punched Powell in the face after Powell had come to help Besiso, while Barnes is alleged to have elbowed Besiso in the face, knocking her unconscious. A rep for Barnes later told TMZ that Barnes was defending himself against a violent group.